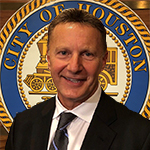 February 20, 2018 -- Mayor Sylvester Turner announced today his selection of George T. Buenik, a retired Houston Police Department Executive Assistant Chief and chairman of the 2017 Houston Super Bowl Public Safety Committee, to serve as the director of the Mayor’s Office of Public Safety and Homeland Security. The divisions within the Mayor's Office of Public Safety and Homeland Security include Homeland Security, the Office of Emergency Management, the Houston Emergency Center and Houston Crackdown. The Mayor's Office of Public Safety and Homeland Security assists the City in its preparedness activities to prevent, protect from, respond to, and recover from man-made and natural disasters or major emergencies. Also, through the Houston Emergency Center division, the Office of Public Safety and Homeland Security ensures that residents' calls for police, fire, and emergency medical services are received, processed, and dispatched as quickly and accurately as possible. Houston Crackdown coordinates and supports community volunteer projects in alcohol and other drug abuse through prevention, education, treatment and rehabilitation efforts. In March 2017, Buenik retired from the Houston Police Department after a 34-year career. During his HPD tenure, he rose through the civil service ranks to the second highest position of executive assistant chief. In that role, Buenik oversaw the Homeland Security Command consisting of special operations, tactical operations and served as the operations’ crisis incident commander responsible for police emergency response to natural disasters and major incidents. Buenik graduated with a bachelor of science degree in law enforcement from Western Illinois University and a master of science in criminal justice management from Sam Houston State University. He is a graduate of the FBI National Executive Institute, the FBI National Academy, Leadership Houston and has additional advanced training. Since 2014, he has worked as the Houston Texans Safety Security Auditor. The numerous professional awards he received include the Houston Police Department’s Lifetime Achievement Award, the Houston Young Lawyers Association Liberty Bell and the National Police Week Manager of the Year award in 2002. Buenik is on the board member of Crime Stoppers of Houston and is an advisory board member of Casa de Esperanza de los Niños.